The Magic Lantern Festival, currently being held at the Botanical Gardens in Birmingham, is the perfect event to get you fully immersed in the Christmas spirit. 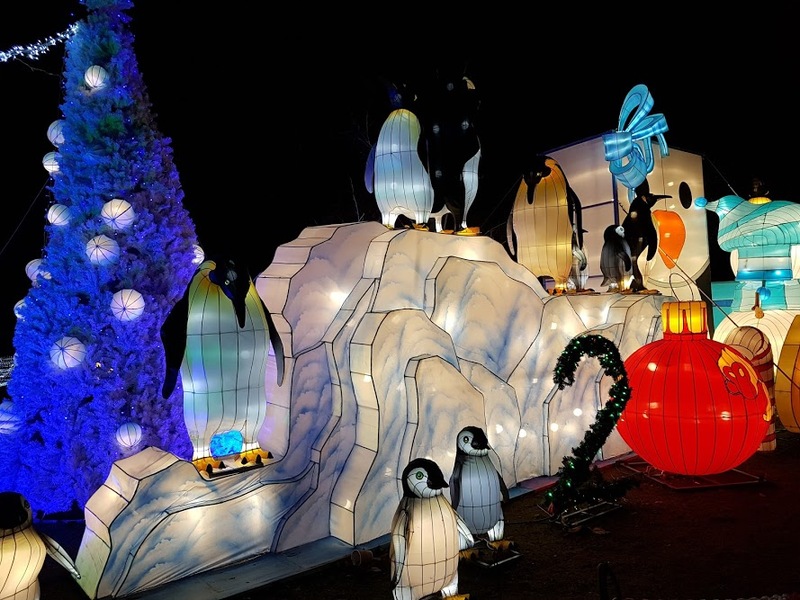 If, like me, you're a touch obsessed with fairy lights and have them hanging all round your house, this ticketed event will, undoubtedly, fill you with joy. I'm not so much a fan of Christmas, but I do love anything that glows in the dark, so after spotting an advert on Facebook for the event in Leeds and London, I conducted a quick Google search with the terminology 'big massive lantern festival in Wales' and, although Wales was not lucky enough to host such an event, it turns out that Birmingham was. I instantly signed my husband and me up for tickets via Eventbrite and started counting down the days. 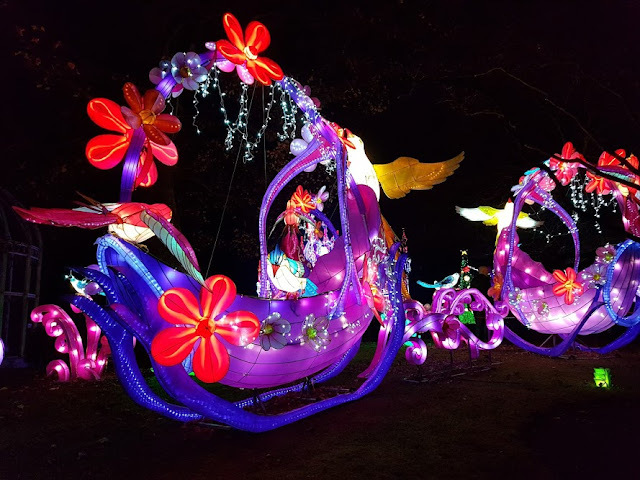 The Magic Lantern Festival was launched in 2015 and, after huge success, it was decided that it would be expanded to other parts of the country. Well, we can't have Londoners having all the fun, can we? Indeed. In 2016, Leeds and Birmingham have joined in the action and I though it would be rude not to go along and lend some support in the inaugural outing. With any luck, Scotland and Wales might be included in the line up in future years as we love a lantern, we do. Anyway, tickets for the event at Birmingham were reasonably priced and you can choose a time slot to attend so that the event isn't overrun with people all at once. We chose a 7pm kick off and were pleased to see the entry area filled with Christmas market type food and drinks stalls, as well as a souvenir gift shop for all things Chinese. 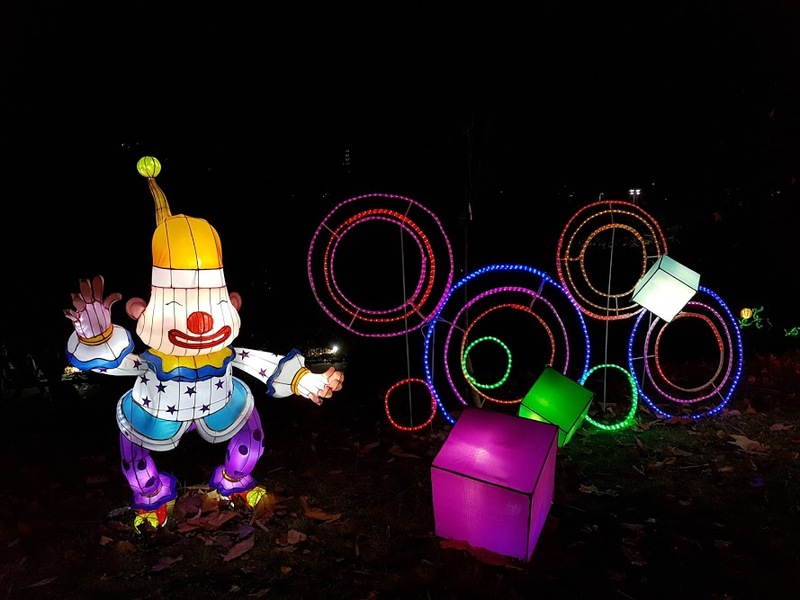 The event had no real theme, although clearly Chinese lanterns gave it an oriental feel, there were also lots of child friendly lanterns, which seemed to be making the younger visitors extremely happy. It's difficult to argue with a 30ft Cinderella, I feel. this would look SO good in my garden. 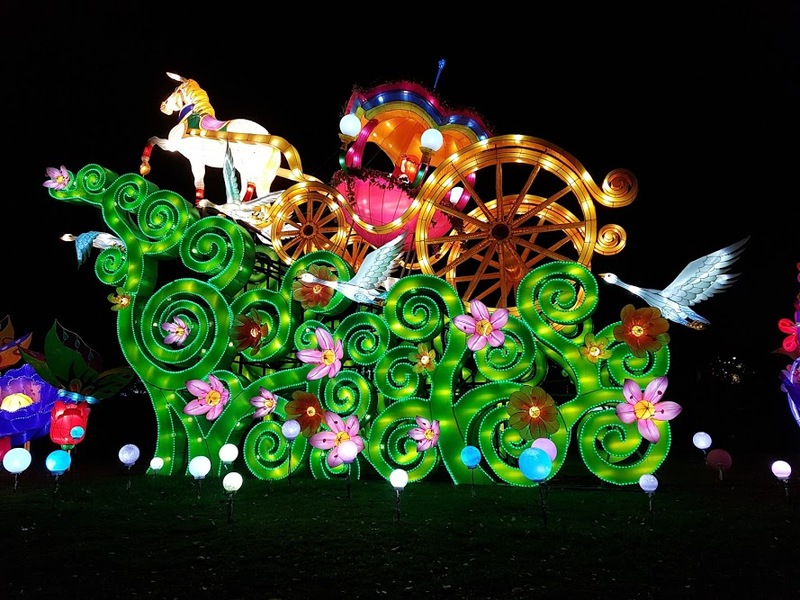 On entry, you walk through a 12 metre wide illuminated curved entrance before you start your walk through the gardens to celebrate more than 2,000 years of fabulous Chinese lanterns. There are classic lanterns throughout the site, as well as modern designs and something local as a nod to Birmingham's wonderful bronze bull. The area is fenced off to stop anyone getting lost and it well signed throughout. This is an excellent thing for me as I have zero sense of direction in the day light. At night, I have literally no chance of finding anything…even if it is a 10ft brightly lit Panda. For two adults, it took us around 45 minutes to walk around the entire site, and this included several thousand photo stops and some slow walking as the event was extremely busy. how cute are these little penguins?? 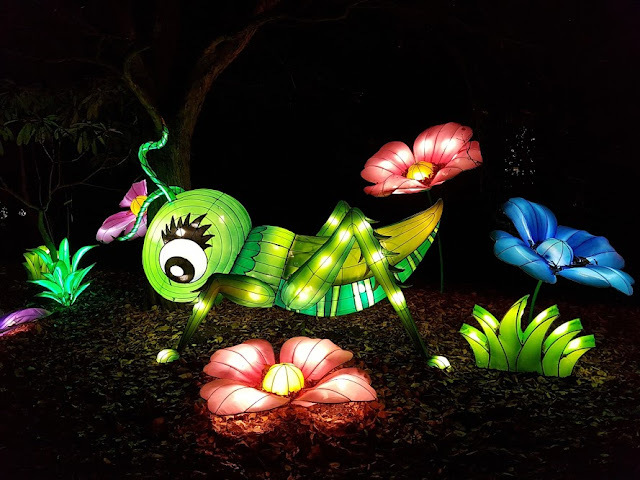 There is a great mix of lanterns; some small and some simply enormous and the combination of the pitch black winter nights along with the gorgeous multicoloured displays are really wonderful. Although the areas are all fenced off to stop people touching the exhibits, it is possible to get a close look at some of them and to appreciated the intricacy of the designs. Lord only know just how long the lanterns take to design and construct, but I'm wiling to bet it's not a quick process. 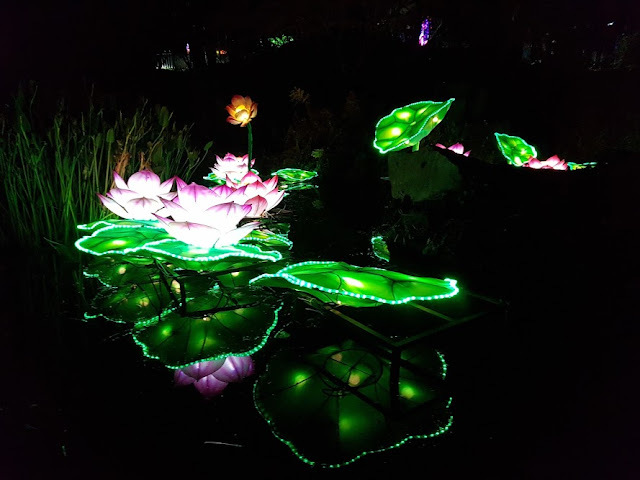 The great thing about the Botanical Gardens is that it gives a large area to properly display each piece and keep everyone's attention all the way round the park. The kids attending with their parents let out a collective gasp every time they spotted something new and colourful and I'm not ashamed to admit that I did a few times, too. The Magical Lantern Festival is open until January 4th 2017 and is great attraction for all the family.